↑ "Khorasan". Encyclopædia Britannica Online. 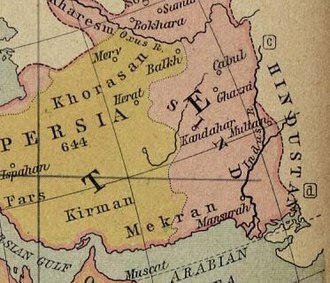 http://www.britannica.com/EBchecked/topic/316850/Khorasan. Retrieved on 2010-10-21. "historical region and realm comprising a vast territory now lying in northeastern Iran, southern Turkmenistan, and northern Afghanistan. The historical region extended, along the north, from the Amu Darya (Oxus River) westward to the Caspian Sea and, along the south, from the fringes of the central Iranian deserts eastward to the mountains of central Afghanistan. Arab geographers even spoke of its extending to the boundaries of India."